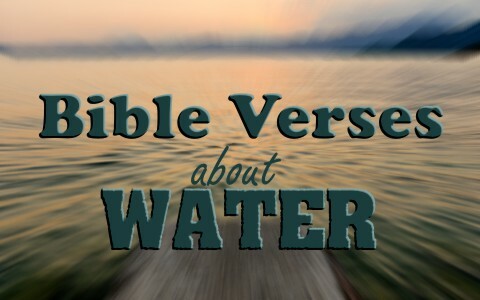 Here are 7 Bible verses about water with a commentary about their meaning. We cannot survive without water and the water that Jesus was talking about wasn’t the kind of water that will satisfy for only a few hours or so. This water satisfies for all time. This spring of water wells “up to eternal life” and He is the only source of that living water (Acts 4:12). At the end of Ephesians chapter five, Paul was writing about God’s expectations for husbands and wives toward one another and in the verses above he gives the analogy of Christ giving Himself up for her, which is the church, as He is the Bridegroom and the church His betrothed wife, and He cleansed her by the washing of the water of the Word. Paul refers to the Word of God, which is also another name for Jesus (John 1:1, 14), as water and the Word washes us just like water washes us or cleanses us. The water of the Word purifies us by what we find in the Word of God. It is no surprise then that Peter refers to the so-called “words of life” (John 6:68) as those words spoken by Jesus. Next to the Book of Genesis, the Book of Isaiah mentions water more than any other book in the Bible and the most common reference to water is the same one that Jesus refers to it and that is in the context of salvation. Water is a great analogy of eternal life as water makes physical life possible while “the wells of salvation” make eternal life possible and this is most certainly the context in which Isaiah writes because verses 3 and 4 are preceded by his writing that “the Lord God is my strength and my song, and he has become my salvation” (Isaiah 12:2). The Apostle John refers to water almost three times as much as the next author of any book in the New Testament. John writes about the “living water” again that will flow “out of his heart” for all who believe in Christ for “if anyone thirsts let him (or her) come to me and drink” says Jesus. Once more the symbolism of water and life come together and in this analytical writing, Jeremiah writes about the deliverance of Israel which can be likened to that of a sinner. Whoever is planted by the water has their roots in the streams of living water (reminiscent of Jesus’ words in John 4 and 7 and also in Isaiah 12). When the heat comes there is no anxiety in times of drought (leanness or trials) for they will not cease bearing fruit. So it is with those who drink from the living waters of faith in Christ. Jesus proclaims “I am the Alpha and the Omega, the Beginning and the End. To the thirsty I will give water without cost from the spring of the water of life” (Rev 21:6) and it is free to drink but it cost Jesus His very life. Are you thirsty? Come to the fountain and drink for everlasting life. Here is something else for you to read: Is Jesus the Only Way? Next post: What Does The Color Gold Represent When Used In The Bible?